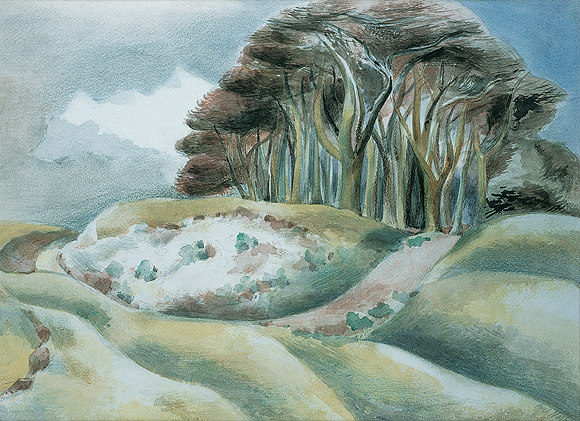 Throughout his career as an artist, Paul Nash (1889-1946) had a special affinity for the wooded hills in South Oxfordshire called The Wittenham Clumps. First encountering them in his late teenage years, he was immediately caught by their atmospheric shapes and mystical associations. The Clumps became a rich source of inspiration and he returned to paint them many times during his life. In 1911 Nash wrote of his discovery of the Clumps, calling them 'a beautiful legendary country'. Nash's first paintings of the Wittenham Clumps were made just over a hundred years ago, in 1912. In celebration, we are exploring Nash's unique connection with the landscape, looking at his work that originated here and showing how the area has changed since his lifetime. Ever since I remember them the Clumps had meant something to me. I felt their importance long before I knew their history. They were the pyramids of my small world.